Home › Lunch and Learn › Lunch & Learn, ToGo! This our blog version of a doggy bag, so you can take home the informational leftovers, whether you were able to join us, or not. 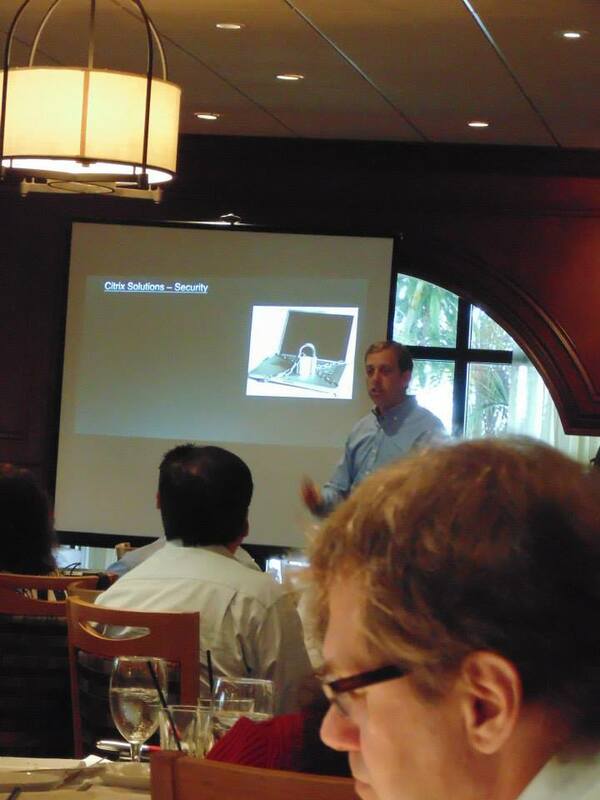 It was a rainy afternoon in Ft. Lauderdale on Wednesday May 29th, but that didn’t interrupt the appetite for knowledge, or a delicious steak at SLPowers latest Lunch & Learn with Dell and Citrix. Ruth’s Chris was, as always, an excellent location for both the lunching and learning. 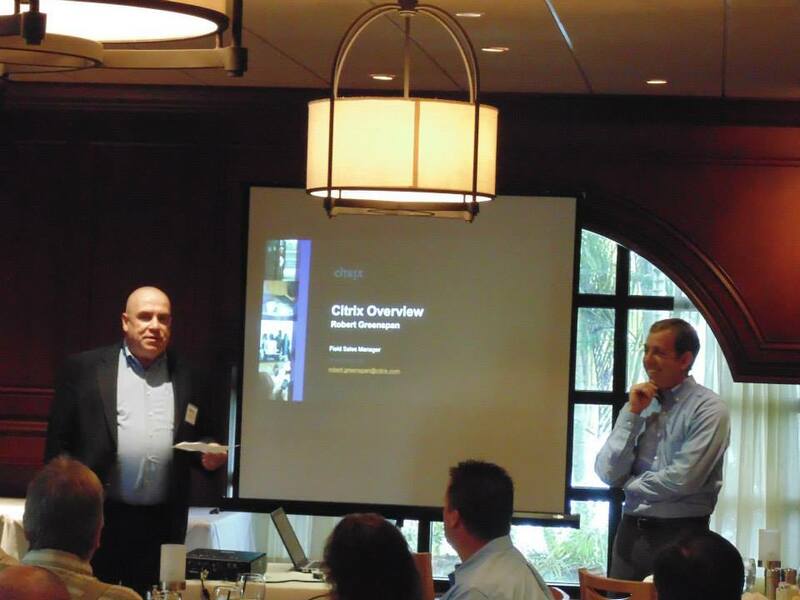 SLPowers Lunch & Learn with Dell and Citrix at Ruth’s Chris in Ft. Lauderdale. Michael Gavaghen, VP of Sales at SLPowers, explained our business model, our technical expertise and our strengths when it comes to not only delivering the most highly qualified and experienced technical assets, but also how we are competitive when it comes to product and software purchases. 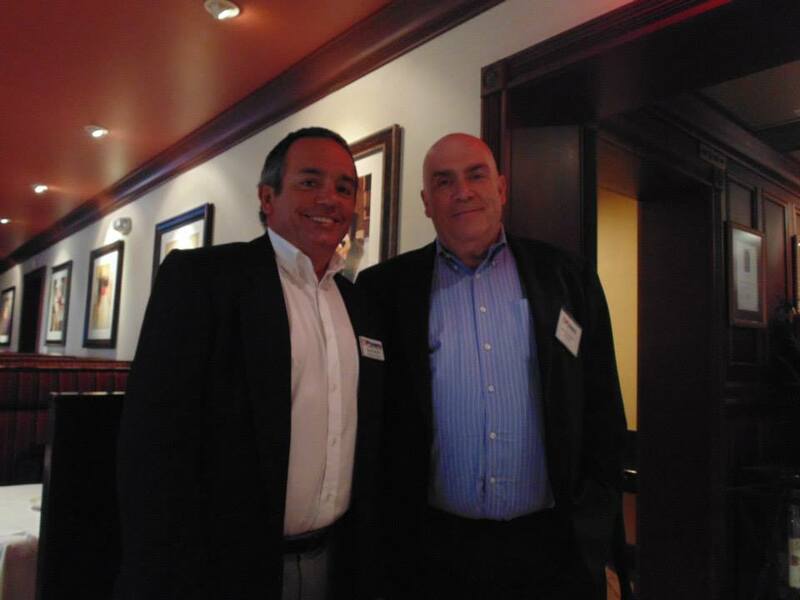 After acquainting SLPowers’ talents to the new faces in the crowd, Michael introduced Robert Greenspan of Citrix. Michael, in true comedic fashion, gave one of the most enlightening, albeit, improvised introductions I have ever heard! There were references to the likes of Emeril, LeBron, Madonna and Randy Jackson in place of Robert’s resume tidbits. It sure got everyone’s interest peaked and wasn’t pitchy at all, dog!! Robert was a good sport and laughed along with the crowd. I don’t think he’ll defer including a lengthy bio next time. Michael Gavaghen introduces Robert Greenspan from Citrix. Robert Greenspan, field sales manager for Citrix shared some information around the highly granular security controls that are built into the Xendesktop offering. He also talked about the efficiency of the Citrix ICA client, and how you can run a virtual desktop on even the slowest internet connection and still be able to take care of business. Robert Greenspan talks about Citrix Solutions. 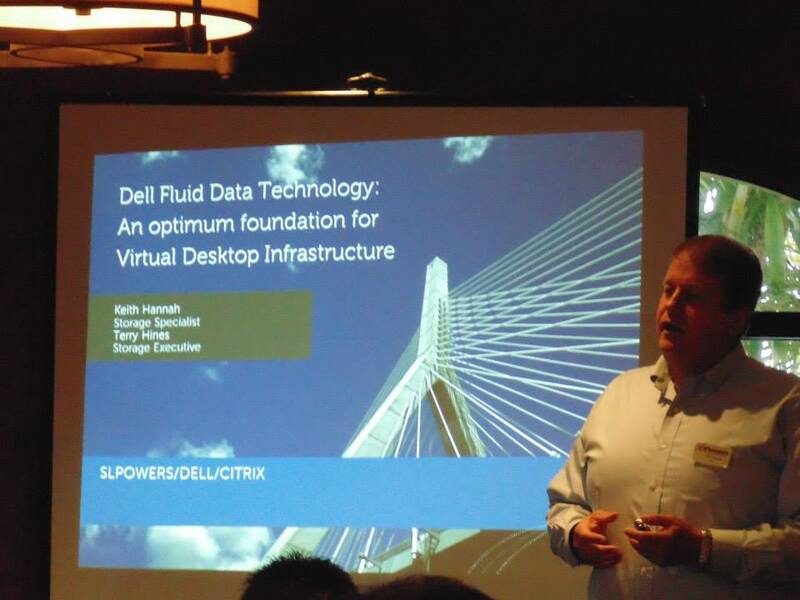 Keith Hannah, Solution Specialist from Dell, discussed some of the important considerations when deciding on a storage solution to support a VDI environment. Keith explained the relationship between IOPS and the type of RAID you select on your SAN. Keith explained how an array with a mix of SSD drives and sas drives can help to contain your costs on spindles while allowing the DELL storage system to decide what needs fast storage, and when it is needed. As always, Keith gave an informative and interesting presentation. Keith Hannah presenting for Dell. It was a wonderfully informative afternoon with some exccellent partners. 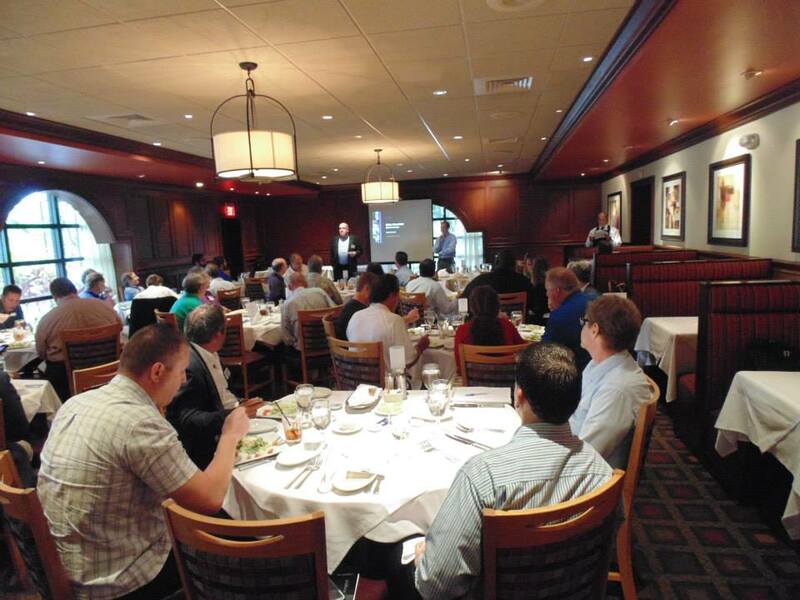 We look forward to hosting a Lunch & Learn with Dell and Citrix again, hopefully soon. If you have any questions about the information presented, feel free to contact us. We look forward to hearing from you. Come see these smiling faces in June at Cha Cha’s Latin Kitchen in Palm Beach! Don’t miss our next affair! We will be at Cha Cha’s Latin Kitchen on Worth Avenue for a special event featuring WatchGuard and EVault. It’s a Lunch & Learn meets Tech on Tap! We will have Tapas and Talks from 2:30pm to 5:00pm in the restaurant. Then at 5:00pm we will move to the lounge for Happy Hour and Paella. You’ll be well fed, with delicious dishes and food for thought. You are welcome to join us for one event or both.